Andrea and I pose with the Andrea Untangled tote bags. A while back, I learned via Facebook that my friend Brian had created a new music venue in Brooklyn called Murmrr, a few miles away from my apartment, in a space he and his business partners leased from the Union Temple of Brooklyn. As long as I’d known him, Brian had been in a band, and one of my first train rides from Long Island into New York City sans parents was to see him and some of our other high school classmates perform as Pesantes at a long-shuttered club in the East Village (their cover of Guided By Voices’ As We Go Up, We Go Down was a favorite of mine). At Murmrr, he arranged for musicians such as Bjork and Nick Cave to perform at the space, also hosting live podcasts, comedy shows and author talks. 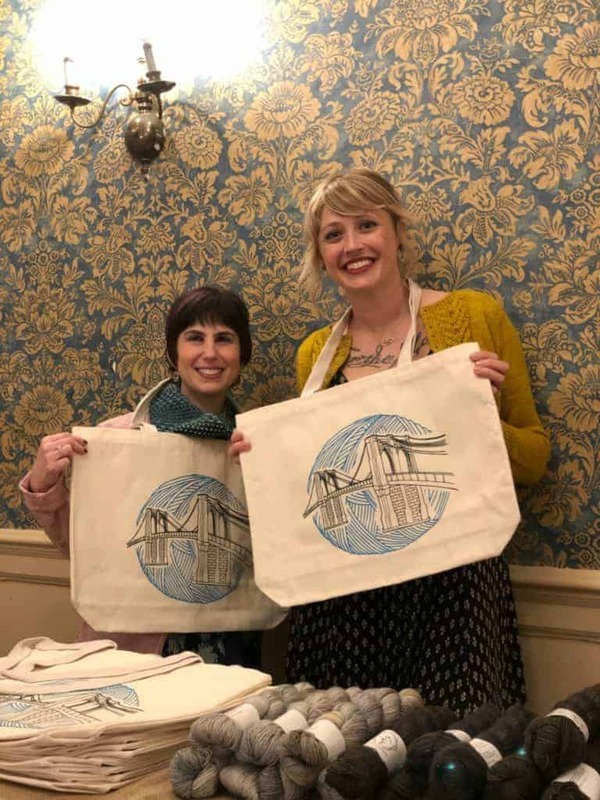 I had already been thinking about doing some Indie Untangled events in the city, but I wanted something that was different from the usual marketplace — especially since I already do plenty of shopping at one of the four Brooklyn yarn shops. After seeing a couple of shows at the new space, I knew we could put together something cool. And Murmrr would be a fitting venue, since so many knitwear designers seem like they’re rock stars. It was with that in mind that I contacted Andrea Mowry and Kristy Glass last year about the idea for what would become Andrea Untangled. Kristy would interview Andrea in what was essentially a live version of her popular podcast, and afterward there would be a small marketplace with exclusive colorways available for some of Andrea’s designs. 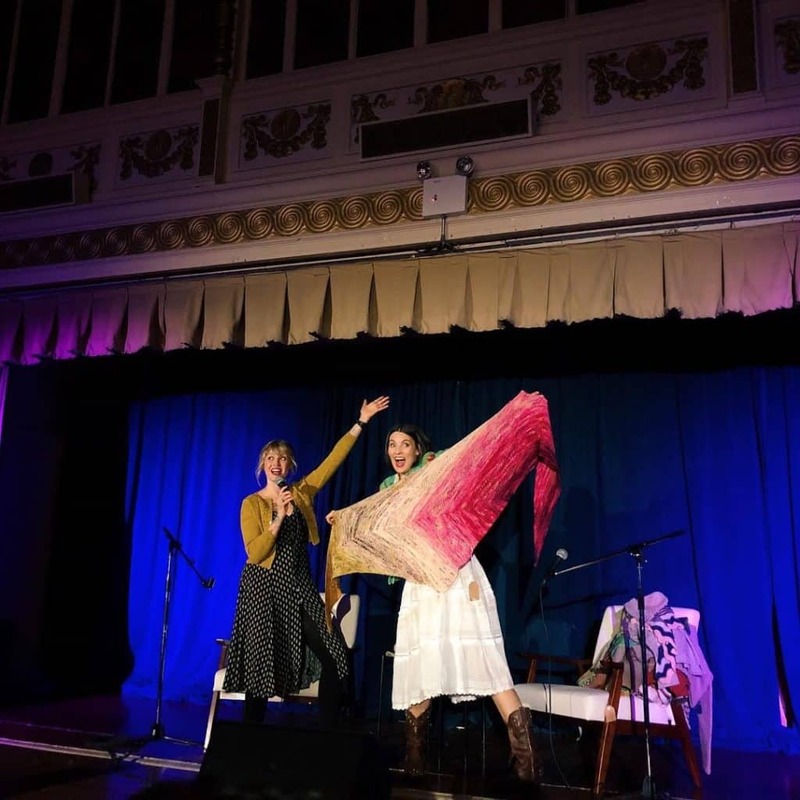 In early January — eerily, a couple of weeks before tickets to Andrea Untangled were set to go on sale — writer Edith Zimmerman wrote a love letter to Andrea in The Cut, calling her “the knitting world’s Taylor Swift. Cute, talented, driven, precise, upbeat, and kind, with a wink and a flicker of darkness. Andrea and Edith after their meeting onstage at Andrea Untangled. 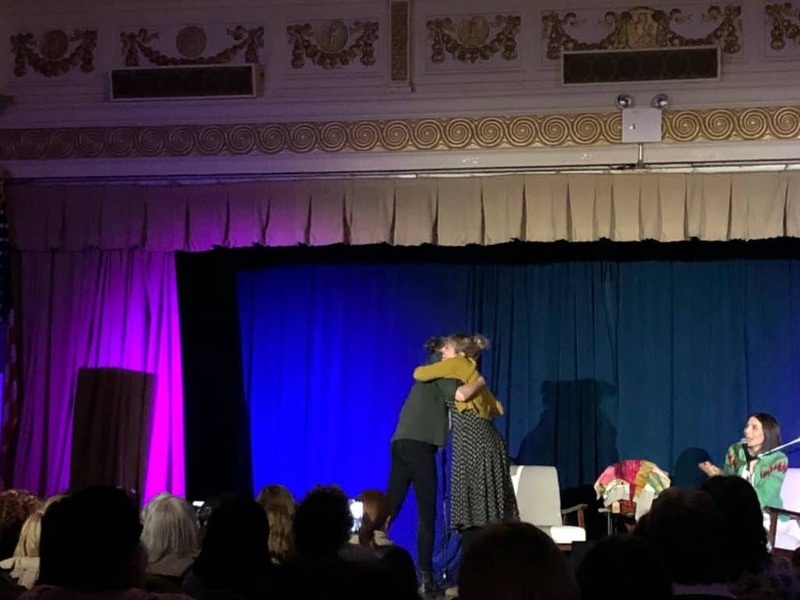 Even though I’m part of the industry, I have to admit that I was still a bit starstruck when it came to really meeting Andrea, not just in passing at Edinburgh or Rhinebeck. While I was not at all nervous about the show itself — I knew that Kristy was a pro, and I felt that if I could execute an event as large as the Rhinebeck Trunk Show, this would be a piece of cake — I did feel first-date jitters as I went out to meet Andrea for lunch Friday afternoon before her first appearance of the weekend at Knitty City. I agonized over what to wear, settling on a black, lacy dress from WISP (a StitchFix find), which I paired with gray tights and a sample of Andrea’s Golden Hour shawl that Paola of mYak had leant me. I couldn’t believe that my job included sharing plates of pierogi and knitting with one of the knitting world’s It girls. Andrea shows off some of her finds at Knitty City. As the weekend went on, I discovered that Andrea was also awed by the fact that this was her job. That people loved her designs so much, they would wear her shawls and cardigans to meet her in unseasonably warm weather, travel to take her brioche class, or write a gushing article about her for New York magazine. Andrea and Kristy show off the famous Find Your Fade shawl. Photo by Emma Holter. In her answers to Kristy’s questions onstage at the main event, Andrea came across as the kind of person that we could all relate to. After Kristy asked Andrea what her favorite food was, my friend Shameka said she whispered to her seat neighbor that hers was curried mango. Andrea replied that she loved mangoes and tofu, which Kristy then suggested would taste great in a curry. Later, when Kristy asked Andrea “What’s your favorite boy band?” and she answered, “The Smiths,” somewhere 17-year-old Lisa was incredibly impressed. Andrea poses with Gaye Glasspie of GGMadeIt. 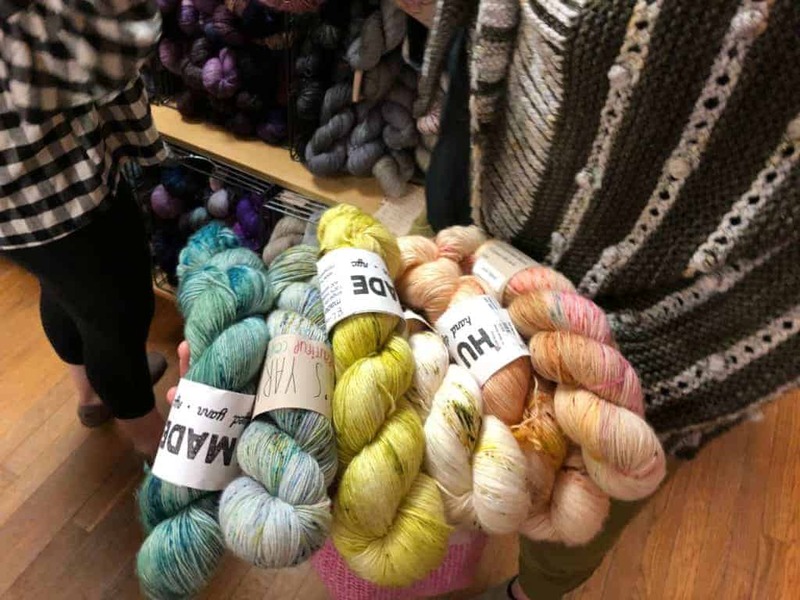 On Sunday, Andrea came to one of my local yarn shops, String Thing Studio, for the last event of her whirlwind weekend, which also included workshops and appearances at Brooklyn General and Argyle Yarn Shop. Her meet and greet turned into an afternoon hangout, with Andrea passing around her samples, giving knitting advice and answering questions as we sat on the cozy couches and in chairs that had been packed in and around the back of Felicia Eve’s tiny shop in Park Slope, not too far from Murmrr. 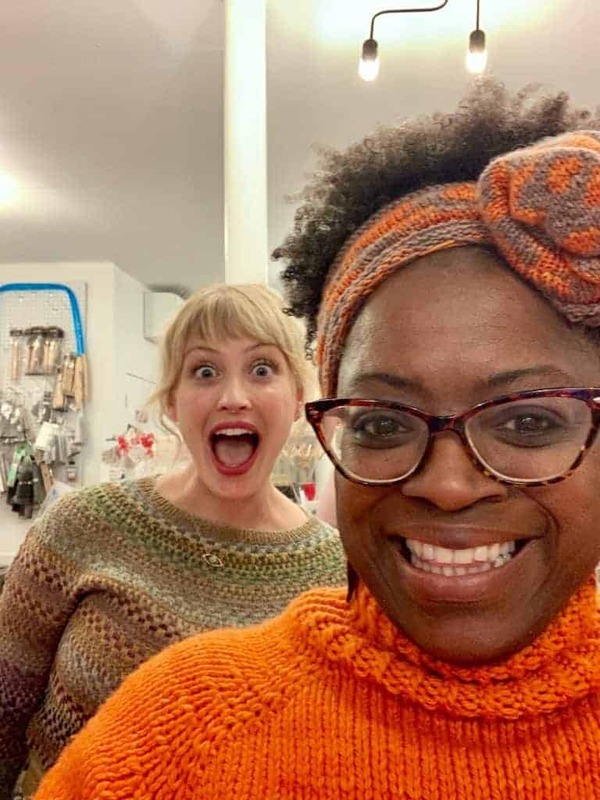 Even as she posed for selfies/photobombs, it didn’t seem all that different from any other knit night. 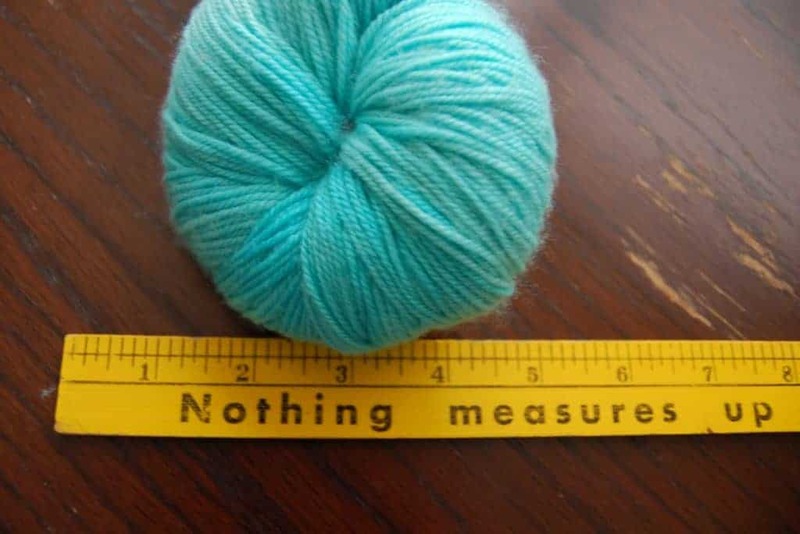 Rock star knitters — they’re just like us.